One of my favorite combos is coconut and almond. The salty, nutty flavor versus the sweet of coconut. My life is always changing and super busy in different ways every week. I am always looking for tasty snacks that help me stay on track. I constantly skim Pinterest and other cooking blogs for new recipes so I do not get bored. If I can’t find exactly what I am looking for I modify to mix flavors I love. 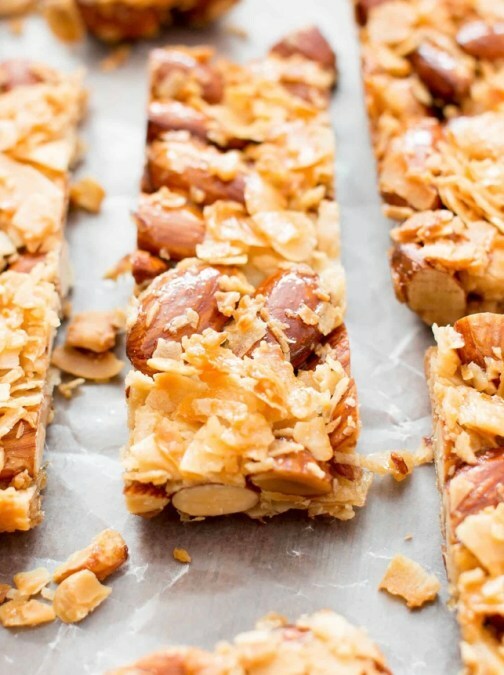 I found this recipe from the Beaming Baker to make my favorite flavor Kind bars. The best part is it only uses 3 ingredients!!! You can always add in fruits (dehydrated or freeze dried) or dark chocolate to mix it up. Just adjust cooking time to accommodate. Preheat oven to 325. Line a 8 inch baking pan with parchment paper. Mix all ingredients and pour mixture into baking dish. Tightly pack in dish. Bake for 30-35 minutes. Bars need to be baked through so they will hold shape. Let cool for an hour. Lift parchment paper by corners and peel off bars. Cut into desired size. Crumble for a perfect topping to yogurt or oatmeal too!